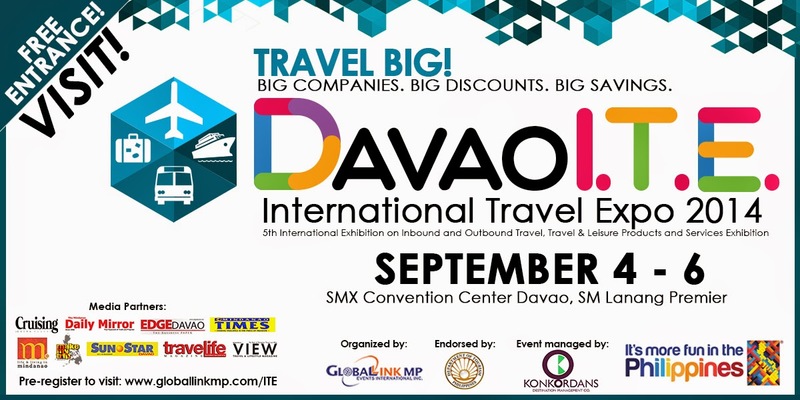 DAVAO INTERNATIONAL TRAVEL EXPO (D.I.T.E. ), the biggest and the most exciting travel exposition in the Mindanao region, is set to open its doors once again at the SMX Davao, SM Lanang Premier on September 4 to 6 to welcome thousands of travel enthusiasts. Organized by Global-Link MP Events International, Inc. and endorsed by the DOT Region 11 – Southern Mindanao, this event is the place to go for the best travel deals in town. The Department of Tourism (DOT Region 11) – Southern Mindanao recorded over 1.4 million foreign and domestic visitors to Davao last year. “Around 97 percent are tourists and many of them are corporate travelers," DOT Assistant Secretary Arturo Boncato remarked. Tourism authorities also attributed the growth to DOT's aggressive campaign to position Davao as an eco-tourism destination and a primary destination for meetings, incentives, conventions, and events or exhibitions (MICE). “We encourage more expos like D.I.T.E. to take place here and capture the Mindanao’s best in both trade and travel,” stated Asec. Boncato. “By holding D.I.T.E. coinciding with interrelated tradeshows PHILCONSTRUCT Mindanao, Manufacturing Technology Davao, and PrintPackPlas Davao, we are providing more opportunities and greater exposure for all industries,” mentioned Patrick Lawrence Tan, CEO of Global-Link MP. Philippine Airlines headlines the list of exhibitors as the Major Sponsor. Some of the participating companies include Avis Philippines, Cebu Parklane International Hotel, Citibank, Crown Regency Hotels & Resorts, Cruising (Going Places) Magazine, Department Of Tourism–Regional Offices, Global Estate Resorts Inc., Las Casas Filipinas, M (Life & Living In Mindanao) Magazine, Orchard Property Marketing Corporation, RCTV Make My Trip Travel TV, Sunlight Hotel, Waterfront Insular Hotel Davao, and many more. Due to the success of the regional International Travel Expo (I.T.E.) shows in Cebu and Davao over the years, Global-Link is bringing I.T.E. to Manila for the first time. “The Manila I.T.E. which will be held as a special feature of the biggest hospitality sourcing event, the Hotel Suppliers Show 2014 happening on the last week of September,” Tan announced. More exciting news, big companies, big discounts, and big savings are in store for visitors of D.I.T.E. 2014. If you love to travel big, whether for leisure or for business, this is surely one event that you wouldn’t want to miss. D.I.T.E. 2014 will be open from 10:30 am to 6:30 pm on September 4 - 5 and from 10:30 am to 5:00 pm on September 6. Hey you were a perfect blogger... I like your page most.Thanks to have such a event for the thousands of travel enthusiasts. We were very glad on behalf of travel enthusiasts i would like to share my views about condor hotel. While these attractions provide hours of amusement, many health-minded individuals want some exercise worked in with their leisure pursuits.Of course, visiting a leisured staying hotel will be more beneficial for everyone as its a ways to enjoy one of the many popular attractions while still maintaining an active lifestyle.